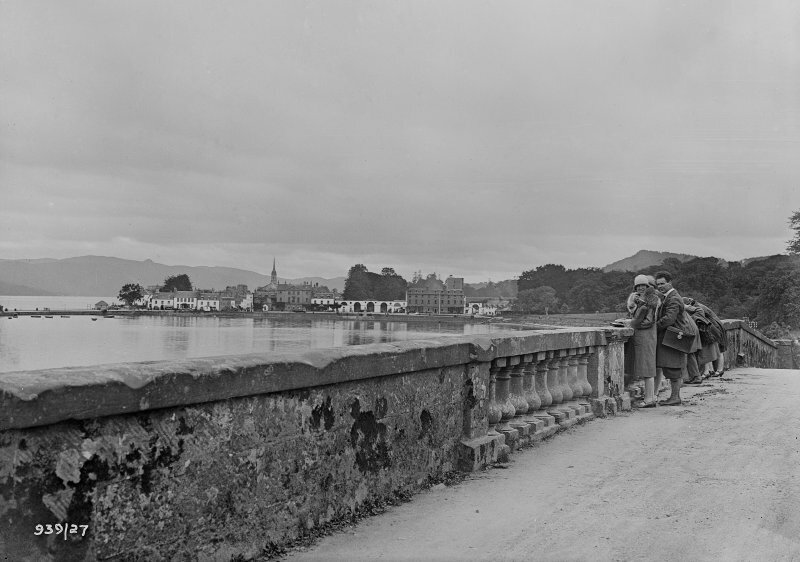 General view towards Inveraray from the Aray Bridge with group of people. 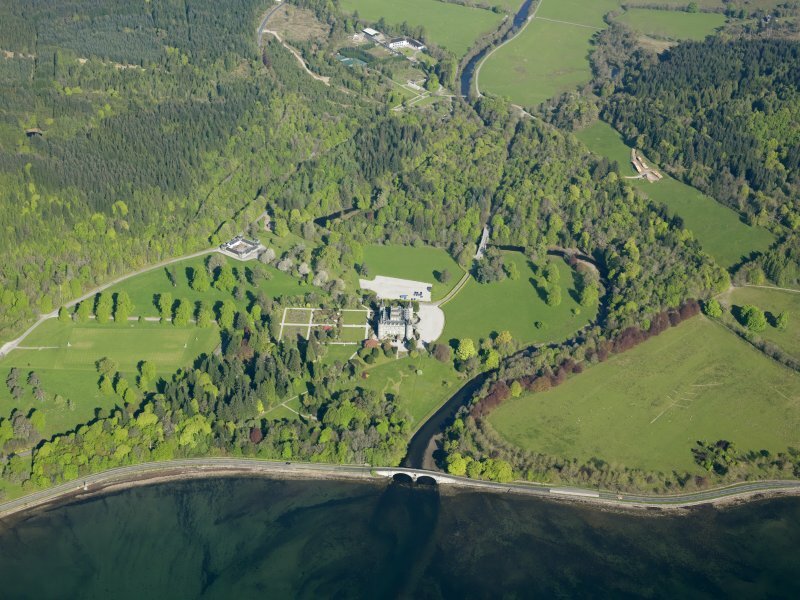 Oblique aerial view of Inveraray castle looking over the Aray Bridge, taken from the SE. 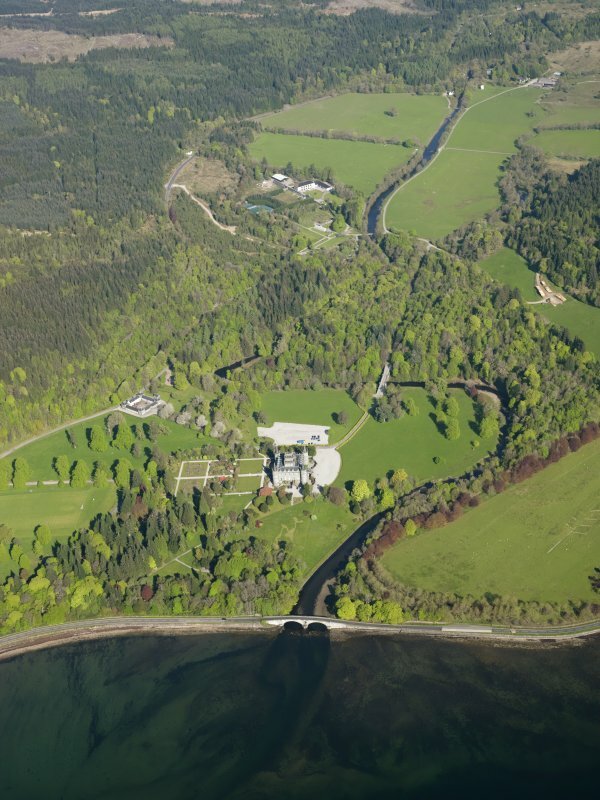 Oblique aerial view of Inveraray castle looking over the Aray Bridge, taken from the ESE. 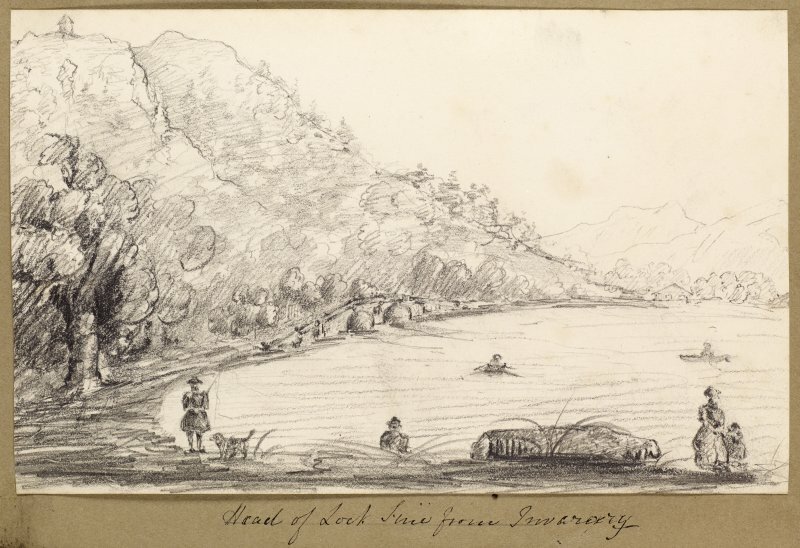 Sketch showing bridge at the head of Loch Fyne from Inveraray. 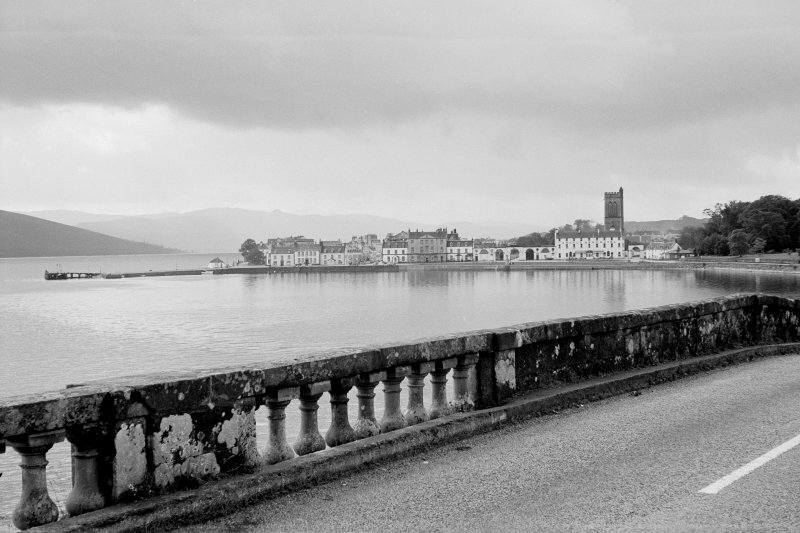 Inveraray Castle, Aray Bridge and Duniquaich. General view across the water from S-S-W.
(Formerly scheduled as Aray Bridge screen wall). Descheduled. Information from Historic Scotland, Certificate of Exclusion from Schedule dated 12 February 2001. Original plans in possession of Duke of Argyll. (Location cited as NN 098 091). Aray Bridge, built 1775, architect Robert Mylne. 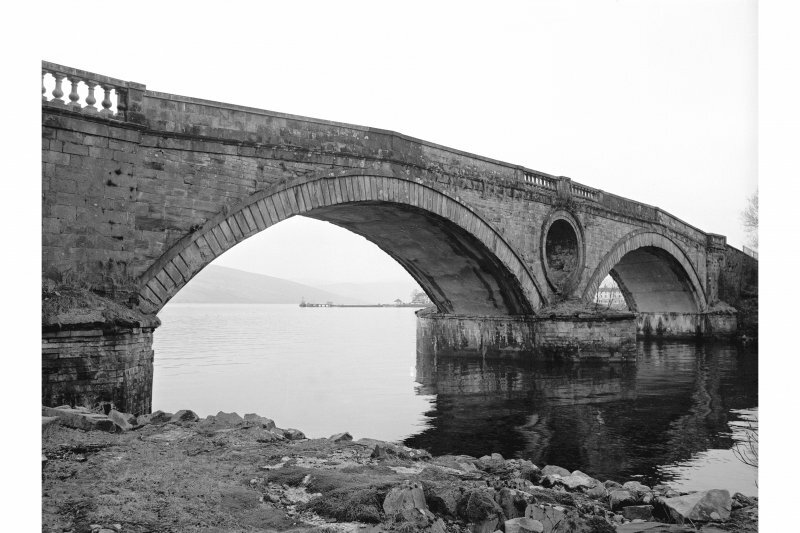 A beautiful two-span bridge, built entirely of dressed stone, with segmental arches and pointed cutwaters. There is a flood relief hole between the arches. The parapets have balustraded end and central parts. This bridge carries the A83(T) public road over the River Aray, just NW of the mouth of the river and about 0.25km SE of Inveraray castle (NN00NE 15). It is depicted, but not noted, on the 1977 edition of the OS 1:10,000 map. Information from RCAHMS (RJCM), 17 May 2006. Planned and erected 1773-76 for the Board of Ordnance. 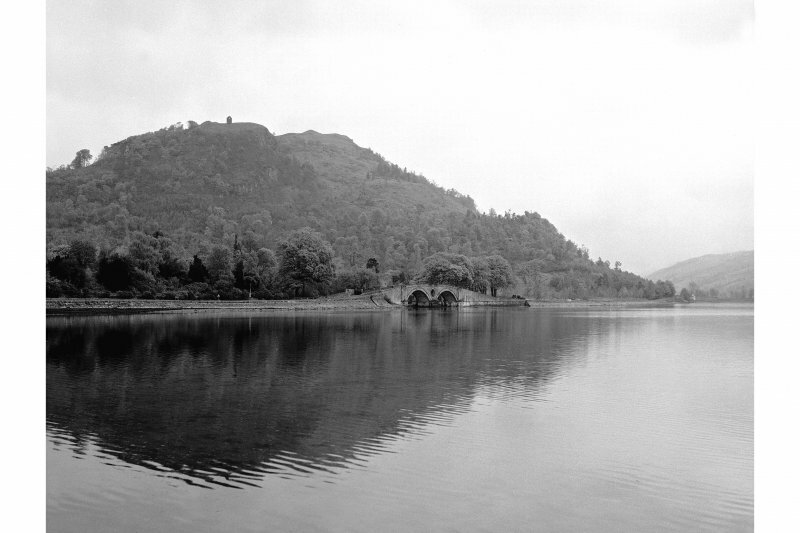 Photographic survey by the Scottish National Buildings Record/Ministry of Work in April 1963. 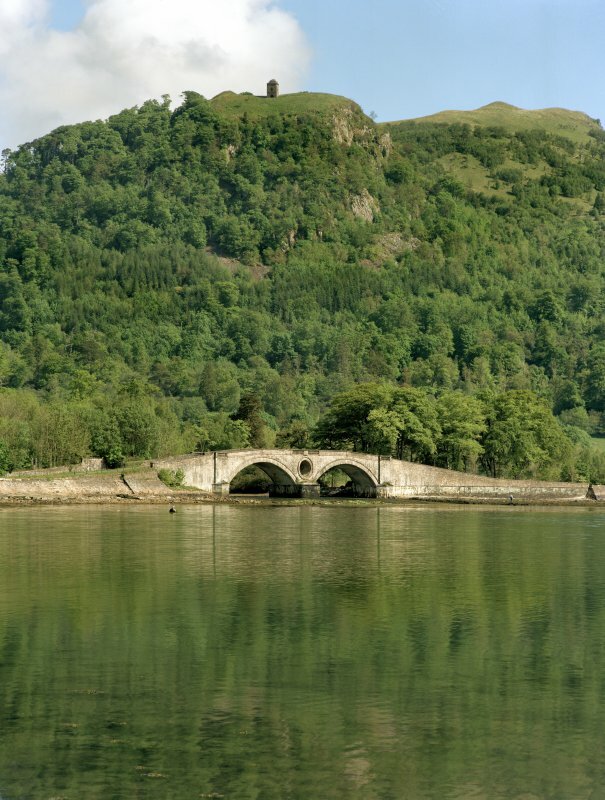 This fine two-arched bridge carries the A83 trunk road across the mouth of the River Aray 250m SE of Inveraray Castle (No. 184) and 0.5km NNE of the new town (No. 200), from which it forms a central feature of the landscape. 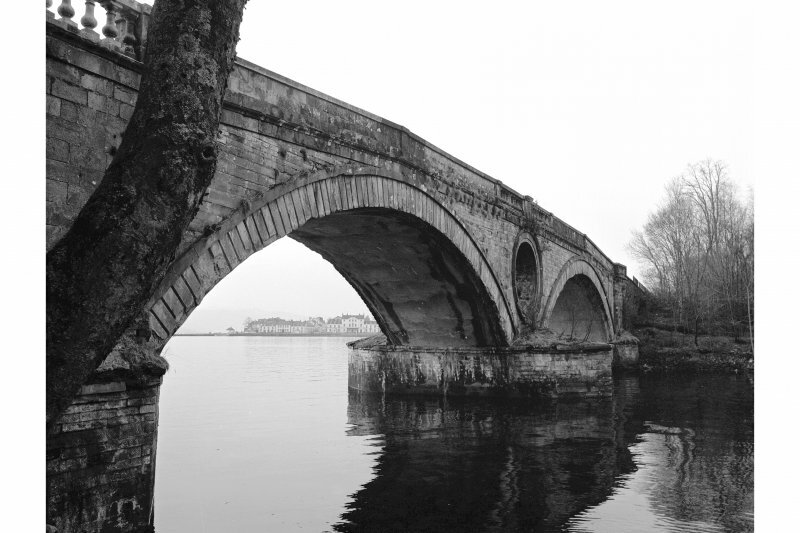 It was designed by Robert Mylne in 1773 to replace John Adam's 'King's Bridge' of 1757 (infra), which linked the military road from Dumbarton to lnveraray (No.264) with that to Dalmally (No.269), and with the county road to Lochgilphead. 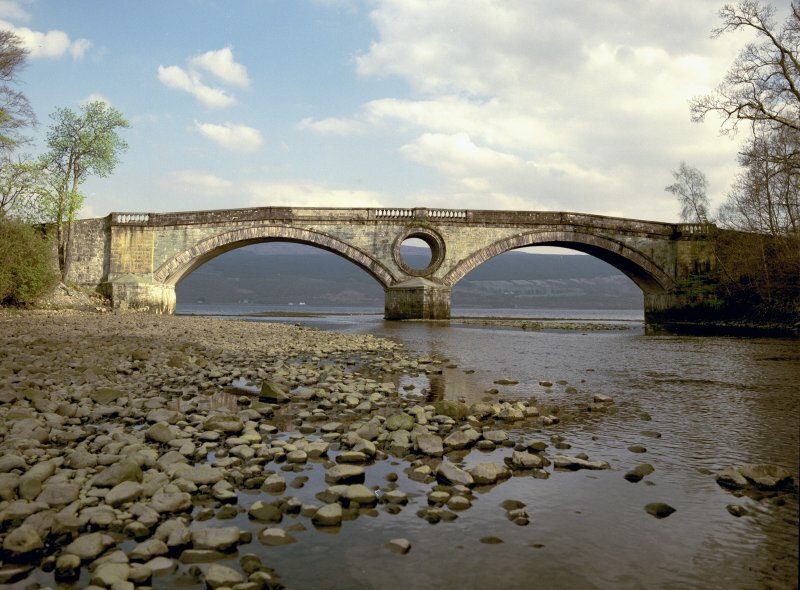 Mylne, who already held a contract to design bridges for the military authorities, surveyed the site of Adam's bridge immediately after its destruction by a spate in September 1772, and in April 1773 he supplied a full set of drawings to be forwarded by the 5th Duke of Argyll to Col. Robert Skene. 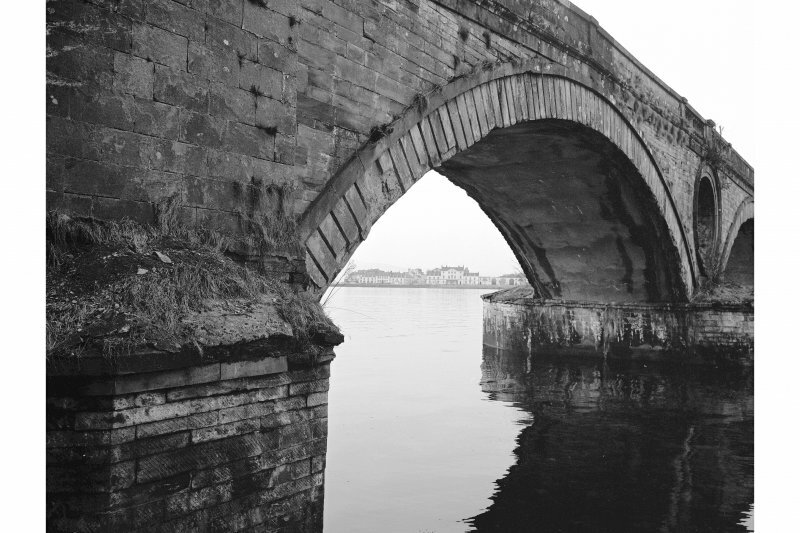 In August of the following year he sent Skene a report 'on making a mound or dam below lnveraray Bridge, and the placing of the bridge', and a contract was signed the following October between Skene and Thomas and John Brown, masons in Renfrew. Mylne inspected work in progress in August 1775, and had a 'long consultation' with Skene, and soon afterwards the Duke suggested that additional balustrades should be introduced to relieve the 'dead and heavy' effect of the solid parapet (en.1*). Total expenditure of £3470 16s was recorded in military accounts between 1773 and 1778, when the bridge was completed, and a further £128 10s was spent in 1781 for a 'bulwark' for the Aray Bridge (en.2*). The bridge measures 54m in length, with each of the two segmental arches having a span of 19.8m and a height of about 7m above high-water level. The overall length including approaches is about 180m, and the NE approach runs along an embankment laid out in 1758 to close off the former 'saltwater pond’ (en.3). The masonry achieves a remarkable polychrome effect by the use of green chlorite-schist ashlar in the cutwaters and arch-spandrels, buff sandstone in the rectangular buttresses at the abutments, and pink sandstone in the arch-voussoirs, parapets, and the 0.75m-wide moulded surround of the 3.3m-diameter void above the central pier. The cutwaters of the central pier are triangular and those of the abutment-piers semi-octagonal, as in Adam's 1757 bridge. Although the arch-soffits are now concreted over, Mylne's section-drawing shows that they were to be composed of deep voussoirs, and that the piers were to be supported by deep piling and built of ashlar throughout (en.4*). The arch-voussoirs are enclosed by plain square bands, and a similar band, leaving a space 0.5m high above the crowns of the arches, forms the base of the parapet on the seaward side, while on the NW side, facing the castle, there is a shallow band with moulding above, tangential to the arch hood-moulds and central roundel as shown on Mylne's drawings. The parapets, which enclose a roadway 5.7m wide, are lm high and 0.35m thick, and are composed of coursed ashlar with moulded cornices except for the central sections of balustrade, 8.6m long and divided by central pedestals which Mylne intended to crown with urn-finials, and the shorter balustrades above the abutment-piers, which were introduced at the 5th Duke's suggestion. Above the crown of each arch the parapet incorporates a slight pilaster, and the roadway and parapets between these, 27m in length, are level, while above the outer arch-spandrels they slope down to the abutments. The revetment-walls of the approaches are of granite rubble, with moulded copings. 'KING'S BRIDGE'. Arrangements for building the bridge were made in autumn 1757 and work was well advanced by the following summer, the contractor being John Brown, a Dumbarton mason (see Nos.266, 272). The design is attributed to John Adam in Vitruvius Scoticus, which shows an early scheme with crenellated parapets, quatrefoil openings in the towers, and larger towers above the abutments; this engraving also shows radially-coursed masonry, as in the Garron and Garden Bridges (Nos. 267, 268), but there is no other evidence that this was used. Two other drawings attributed to Adam differ only in the heights of the flanking towers, and Pennant's engraving, from a view taken just before the destruction of the bridge in 1772, shows that one of these was followed (en.5*). The overall length of the bridge was 61m and the distance between the abutment-piers, some 51m, was about 5m greater than that of the later bridge, so that parts of the abutments may remain encased in the existing abutments and approaches, whose copings appear identical in form with those shown by Adam. There were three segmental arches, the central one being 15.9m in span and the other two, whose keystones were about 0.6m lower, having spans of 12.8m. The abutments and cutwater-piers were similar in plan to those used by Mylne, but with flat tops from which semi-circular buttresses, 3m in diameter on the piers and 3.5m on the abutments, rose as towers enclosing refuges (en.6*). These towers had crenellated parapets on corbel-courses, most of which had disappeared before Pennant's visit, and were divided by corbelled stringcourses continuous with the base-courses of the balustrades, which resembled those of the Garden Bridge but had four rectangular pillars in each section. As in Mylne's bridge, the parapets and roadway, which was 5.2m wide, rose gently to a level section above the higher central arch. An architecturally-inspired twin-span segmental masonry arched bridge over the Aray with a conspicuous oculus (cylindrical opening) through the spandrel over the central pier. This feature enables the bridge to escape the unattractive appearance offered by two equal spans of 65 ft, referred to as an ‘unresolved duality’ in architecture. The bridge was planned and erected from 1773–76. It was designed by Robert Mylne for the Board of Ordnance and the contractor, J. Brown. The Duke of Argyll, whose seat Inveraray Castle overlooks the bridge, is said to have influenced its design, particularly the parapets. The steep approaches must have been a trial to horses pulling heavy carts. The bridge is now operated as a single-lane carriageway controlled by traffic lights.